From depths adjustment to blade change and spindle lock systems that rate a great circular saw high. This ratings and review article is part of the circular saw review series. 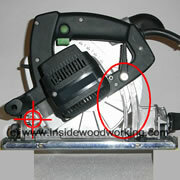 To get started please find the circular saw review TOC here. Old Festo pendulum circular saw showing a front pivot depths adjustment. Depending on the depth of cut, the angle of the saw handle changes into a less comfortable grip. Plunge cut saws come with a rear pivot depth adjustment. 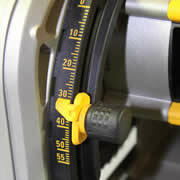 As seen on this Dewalt saw, the depth stop can be quickly moved (pull and release) and reset in a different position. Depths Adjustment through two parallel guides. 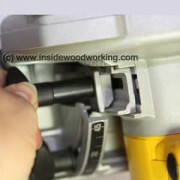 Picture shows a Dewalt 365 circular saw/trim saw with parallel depths adjustment. Other power tool companies such as Mafell use round bars to guide the saw. Which circular saw depth adjustment is better? For pendulum guard circular saws: the parallel guide, depth adjustment system is best. It offers the best in maneuverability and precision and is the recommended system on a circular saw. That’s because it doesn't change the angle of the handle. Unfortunately only few manufacturers offer parallel depths adjustment systems on circular saw (Mafell on some models and Dewalt on very few models - dw365). When looking at the plunge cut saw, you’ll discover the rear pivot depth adjustment system to be the best. This is one of the more logical design that combines the Plunge Cut downward motion with a depth stop component. In general, when you analyze a circular saw you may want to check whether or not your saw’s depth adjustment component is really stable. Be aware that on some low-end saws for DIY enthusiasts the pivot is flexible and not as solid as in some higher end models. As you examine the array of saws be sure about its stability when you cut at both minimum and maximum depths as the saw is fixed into the saw base. In addition, be certain that the depth adjustment regularly offers a quick-change mechanism. Some low-end units offer this advantage with a simple wing screw to adjust the cutting depths. The majority of professional circular saws allow you to adjust cutting depths ‘on-the-fly’ using a quick-change lever. Speed of depth adjustment and precision is affected by the stability of the power tool is key when you review the depth adjustment systems. 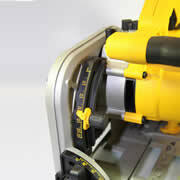 Using a circular saw to create miter or bevel cuts is an essential way to use the saw in many woodworking projects. Many of the lower end circular saws will only bevel using a fixed pin at the base. As you tilt the saw its cutting line moves away from the 90° standard cutting line. Most low-end saws allow to be tilt up to 45°, while some professional circular saw will do cuts up to 60° miter. Bad bevel adjustment on an older circular saw. You may encounter poor visibility along the site-line (which is move as you tilt the saw to accomplish your bevel). 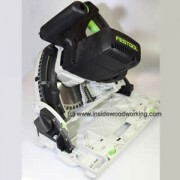 The Professional Festool model TS 55 EBQ track saw with excellent visibility and bevel adjustment. 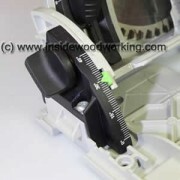 Your best bevel adjustment is currently available with a power tool such as the Festool model TS 55 EBQ. This saw tilts and tracks at the same cutting line, which begins 90° straight cuts. This is the ideal tool for use on a guide rail systems. Some power tool manufacturers such as Festool, have overcome this change in tracking difficulty with a very clever beveling system. These manufacturers have developed a tilting mechanism that allows the saw to tilt exactly in the same way as with 90° cuts. This allows the saw to cut exactly at the same line regardless at what angle the saw will tilt. 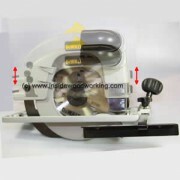 Professional modern circular saws are commonly used on guide rail systems (track saw). These circular saw guide systems are fixed aluminum rail guides and allow you to cut exactly the same way every time. 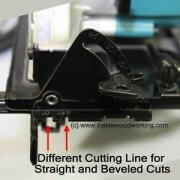 If the cutting line where different on beveled cut, the saw would no longer cut exactly at the edge of the rail. (More details on circular saw and guide rail systems here in this circular saw review article series). Blade changes on circular saws don't happen as often as on a jigsaws or reciprocating saws. However from a woodworker’s point of view, changing for example, from cross cut blades to rip cut blades, needs to happen reasonably quickly. Most of circular saws use an allen key (often attached to the power tool) to fix the blade. 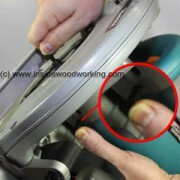 In order to perform the blade change easily most professional circular saws come with a spindle lock mechanism (see image left of a Makita circular saw with spindle lock), to block the spindle with your thumb while changing the screw. On plunge cut saws, blade change is a bit trickier since the blade needs to be pushed down in order to access the screw. 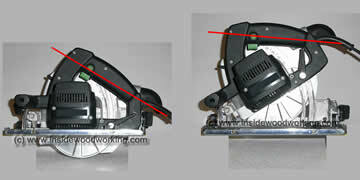 Some manufacturers (like Festool) equip their plunge cut saws with a quick blade change mechanism, holding the saw in the best position while easily changing the blade. On the next part of this series we will rate and look into circular saw safety features such as blade guard lever, guard with push-wheel and the riving knife.